By Republic on 14 August 2017,Construction at the $360 million Mount Emerald Wind Farm near Mareeba reached an important milestone last week when the first of 53 turbine foundations was put in place. The 800-tonne foundation which is buried to ground level provides an immovable anchor for each turbine and consists of a 50-tonne reinforced steel cage filled with around 350m3 tonnes of concrete, or up to 70 truckloads. Ratch Australia Corporation Executive General Manager Business Development, Mr Anthony Yeates, said the first foundation was always a special milestone in wind farm construction. “Getting the first foundation poured is the first big ticket items on our scope of works that has to do directly with the wind turbines so for us it’s a special moment that salutes years of hard work by many people in our team,” he said. Mr Yeates said the concrete used for each foundation will be manufactured onsite to reduce truck movements on public roads. Up to four weeks is allowed for the concrete to cure to maximum strength before the foundation is backfilled with rock and soil to match the natural surface level. At this point, the foundation is ready for the bottom section of the tower to be bolted to it. 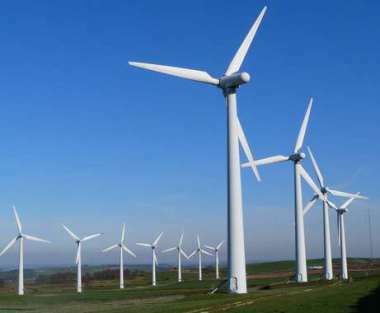 Wind turbine components will be delivered over an eight-month period starting in October. The delivery route will see trucks head south from Cairns along the Palmerston and Kennedy Highways before Hansen and Springmount Roads are used to get to site. All parts will be delivered with the approval from the Department of Transport and Main Roads for oversize loads. A detailed route assessment plan including any proposed modifications to intersections is required for this approval. Each turbine will have a capacity exceeding 3 megawatts (MW) making a total capacity of around 180MW to be connected to the electricity grid. Once fully operational in September 2018, Mount Emerald will be the biggest wind farm in Queensland.